Artist Residence Cornwall is a boutique hotel in Penzance which brings a slice of eccentric charm to the dreamy lanes of the historic town. With 22 eclectically decorated bedrooms and a cosy 3-bedroom cottage, the revitalized Georgian pile is a unique seaside inn perfectly situated for daily forays to the beaches, and the Isles of Scilly, a short stroll from the pubs, restaurants and bars of Penzance town centre, the unique art deco lido and a sea view of the fairytale that is St Michael's Mount. 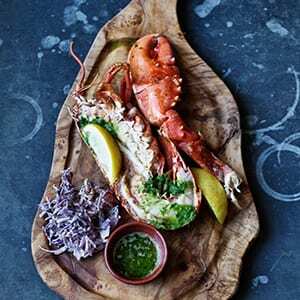 Downstairs, The Cornish Barn smokehouse is a buzzing community hub, serving up glorious feasts of locally sourced meat and fish, while the laid-back, intimate bar and secret terrace garden are the perfect after-dinner hideaways. Your home from home in West Cornwall with comfy beds, limited edition art prints and eclectic furnishings. A selection of rooms also have bathtubs, or opt for The Lookout or The Cottage for some extra lounging space and cosy log burners. *Some rooms are dog friendly – please enquire when booking. Comfy rooms featuring unique artist décor, king-size or twin beds, armchair, en-suite shower rooms and rooftop views over Penzance. Our comfy doubles are decorated in an eclectic style and feature double or king-size beds, limited edition prints, antique furniture and modern en-suite bathroom with shower. The ground floor and 2nd floor rooms feature a shower over bath. The 3rd floor room features rooftop views over Penzance and a writing desk. This peaceful room features limited edition art prints, a double bed, day bed/full size single bed and en-suite shower room. This is a rear-facing room. Super king-size antique sleigh bed, sofa or full size single bed, bespoke wallpaper and vintage-inspired design. This room features original wooden floorboards, a floor-to-ceiling bay window, views over Chapel Street and en-suite shower room. Spacious room with eclectic décor and original canvases by local artist Mat McIvor. This bedroom features a high vaulted ceiling, original floorboards, double bed, pull-out sofa-bed and en-suite shower room. A compact mezzanine has a further small single and double bed for little ones. Family room sleeping up to 5 guests. Our Comfy Luxe rooms are light, bright and airy with a seaside feel. Featuring king-size beds, roll-top baths and en-suite bathrooms with rainfall showers. 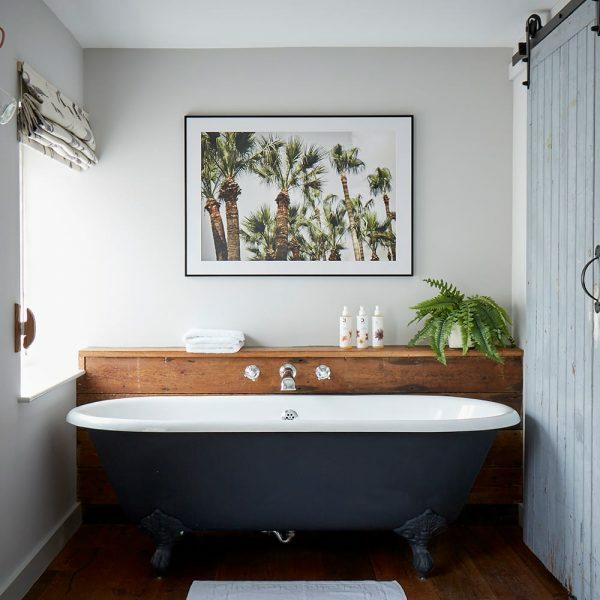 Some rooms feature bathtubs in the bedroom. Treat yourself with one of our Super Comfy Luxe rooms, featuring unique decor and furnishings, super king-size beds, large writing desks and luxurious bathrooms with walk-in rainfall showers and roll-top baths. 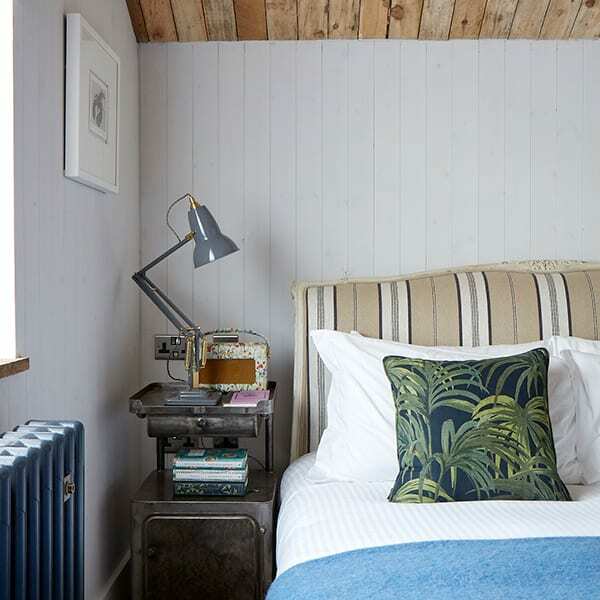 The best room in the house, The Lookout is a luxe retreat with exposed beams, antique furniture and unique reclaimed pieces perched above the rooftops of Penzance with sea views towards Newlyn and Mousehole. Featuring a super king-size bed, separate cosy living space with log burner, a small dining area, statement bathroom with copper free-standing bathtub and separate rainfall shower and a rustic kitchenette fitted with all the essentials. A seaside retreat for families and groups of friends, the cottage sleeps 2-6 people in three bedrooms, one with a king-size bed, one with a king-size or twin beds, and a snug bunk bed room with two full size single beds. Featuring an open plan living room and kitchenette with statement log burner, comfy seating area and a dining table for 6, as well as a luxurious bathroom with copper roll-top bath and walk-in rainfall shower. A number of our rooms are able to cater for cots and your furry friends too! There is a surcharge of £15 per dog, per night, which includes a dog bed, bowl and treats from Lily’s Kitchen. 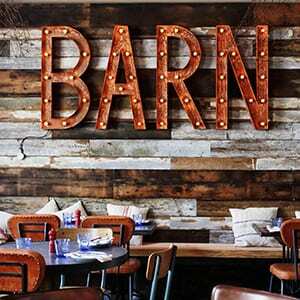 The Cornish Barn is a rustic restaurant, bar and smokehouse serving a wholesome menu with a focus on fresh Cornish produce. Starters make good use of foraged and seasonal ingredients, whilst meat and fish is cured, hung, smoked and charred for a rich and distinctive flavour. Settle in to our homely bar and lounge, complete with log burner and serving a range of Cornish lagers, ales and cocktails crafted with foraged ingredients and Cornish spirits. Comfy and cosy, this is the perfect spot to relax after a long day with a glass of wine. Open daily. When the weather's on our side, there's nothing quite like soaking up the Cornish sunshine, ice-cold beverage in hand, or perhaps with a game of ping-pong?